Cast in pewter, the 3 inch (7.62cm) tall Two Dial Howard Post Clock ornament is an ideal gift for any clock lover! The ornament is attractively packaged on a maroon velvety card wrapped in cellophane. 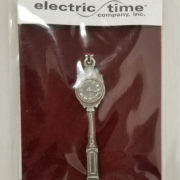 It is a tiny scale replica of the full-size Two Dial Howard Replica Post Clock manufactured by Electric Time Company, Inc. This item may be purchased through this ebay link, for quantities or special orders please contact us via this form.